This year the festival has a country focus, and the country to be highlighted is none other than the Philippines! If you have been curious about Philippine children's books, this year's festival will be the perfect opportunity to hear from and network with some Filipino writers, illustrators, and book reviewers. I'd most especially like to invite you to attend the two panels I am facilitating, "Trajectories and Themes in Children's Literature from the Philippines" and "The Art & Science of Writing Book Reviews: Online vs. Print." In "Trajectories and Themes," popular author-illustrators Russell Molina and Jomike Tejido will be sharing the special features of Philippine children's books and trends in the local market, while Candy Gourlay and Isabel Roxas will be sharing their success stories as internationally-recognized children's book creators writing and illustrating with a distinctly Filipino perspective. In "The Art & Science of Writing Book Reviews," online and print book reviewers Blooey Singson (the Philippines), Daphne Lee (Malaysia), and Anu Kumar (India/Singapore) will be discussing the rewards and challenges of book reviewing for different formats and how they overcome those challenges. Also for the first time this year, the festival will include a Rights Fair, where industry professionals can exchange information and services, as well as trade and make deals. Think "the Asian Bologna"! Lastly, I was very pleased to hear that the 2012 Asian Festival of Children's Content will launch the SingTel Asian Picture Book Award, to be presented annually starting 2013 to an outstanding unpublished picture book with an Asian theme. The award aims to encourage and inspire the creation and publication of more Asian-themed picture books and to stimulate public interest and awareness of picture books. 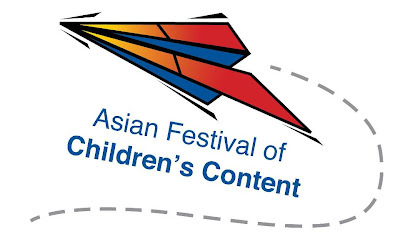 For updates and more on the Asian Festival of Children's Content, visit the official website, follow the #2012AFCC hashtag on Twitter, and read my other blog posts about the festival. Exciting news! Great to see the AFCC continuing to grow and expand. Such a wonderful festival that is really taking off and earning a well deserved fabulous reputation! It won't be the same without the PaperTiger ladies!! !